There are tons of cheap ukuleles out there, and some of them are pretty good. If you’re ready to take your playing to the next level and experience a better sound though, you might want to spend just a little more. Believe it or not, some of the ukes that made their way onto this budget-friendly list are also among the best ukuleles made by larger manufacturers. Advanced features, better accessories, quality setups, and better tonewood are just a few things you’ll enjoy when you decide to spend just a little more on your new ukulele. After comparing more than 50 ukuleles under $200, we’ve come up with this helpful list. Kala ukuleles are among the best on the market, and this one is a fantastic addition to their line. The Kala KA-PWC Pacific Walnut Concert Ukulele offers beautiful Pacific Walnut wood construction; the top, back, and sides are all solid tonewood rather than laminate. The ukulele’s neck is made with mahogany, and the fingerboard is walnut to match the body. This fantastic uke features sleek, simple black binding, a standard headstock, Graph Tech NuBone nut and saddle, and Aquila Super Nylgut strings. A smooth satin finish protects the wood while keeping the instrument’s look warm and natural. This ukulele is part of a package that includes a clip-on tuner, a polishing cloth, an instructional DVD, and a protective hard case. This is a great entry-level instrument. I’ve been playing for about 7 years and this is a fun uke. I have two others that were much more expensive but I’ve been hard pressed to put this one down. My daughter loves it! We opted for the Kala for the sound quality and it was worth the extra money from the base model Kalas. Sounds amazing. Pair it with some felt picks and you’re ready to go! Not only is the Kala KA-PWC a beautiful instrument made with richly patterned, solid walnut wood, it offers a great setup right out of the box, including good-quality strings. 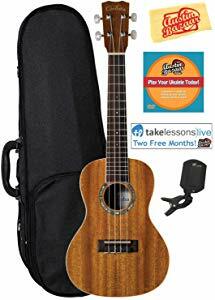 It easily satisfies budgetary constraints while offering a nice step up from a basic laminate wood or low-quality plastic ukulele, plus it comes with a hard case that represents a bit of an investment all by itself. If you’re looking for a good package deal on an instrument that’s built to last more than a few years, this one is likely to appeal to you. 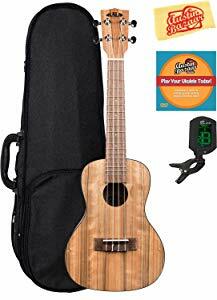 The Cordoba 15CM Concert Ukulele comes as part of a bundle deal that includes a hard case, a clip-on tuner, a handy polishing cloth, and an instructional DVD to help you get started with your new uke. This a beautiful instrument thanks to its mahogany wood top, back, and sides. An abalone rosette adds a touch of contrast while keeping the look classic, and a natural satin finish lends a rich look without picking up too many fingerprints along the way. Cream ABS binding, rosewood fingerboard and bridge, a composite saddle, and pearloid fingerboard inlays complete the look. This ukulele features Cordoba silver tuning machines with pearl buttons, and comes with Aquila New Nylgut Concert 7U strings. This ukulele sounds great and it’s a very nice quality instrument for the price. 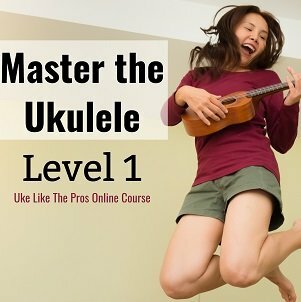 I highly recommend it for anyone who want to pick up the ukulele, but wants a reasonably priced instrument. It’s everything you could hope for and more. The sound is terrific…this is a real instrument, not a toy. While it does sound like a traditional uke, it has none of that tinny sound of other low cost models. Tuning pegs work great and it seems to keep tune quite well. If you’re in the market for a ukulele that’s well under the $200 mark, you’re definitely going to want to give this one a look. Good components, a top constructed of nice solid mahogany tonewood, and meticulous construction pair with nice extras, making this an outstanding choice for the serious beginner or an intermediate player who’s ready for an upgrade. The Oscar Schmidt OU5 Concert Ukulele features select Hawaiian Koa wood, which is used for the body as well as the top. Abalone binding and an abalone rosette combine with a gorgeous gloss finish, making it a standout. A Nyatoh neck supports the rosewood fingerboard, which offers some contrast along with the rosewood bridge. Grover chrome tuners and Aquila strings add even more value. Oscar Schmidt stands behind the OU5 ukulele by offering a lifetime warranty. I would consider this ukulele to be one of the best beginner ukuleles and one of the best ukuleles for the buck on the market. To get a considerably nicer instrument would cost considerably more money! Not only is this a beautiful ukulele, but the Koa wood gives it a true ukulele sound – smooth and beautiful! The action is set up great all the way up the frets and maintains tuning quite well. No bleeding of overtones, with clean, clear notes, really easy to play. There’s a reason why the Oscar Schmidt OU5 makes it onto so many “best ukuleles” lists! This company has been making stringed instruments since 1871, and they’re famous for using quality components such as the Grover tuners featured on the OU5. Every instrument is inspected and adjusted in the USA by one of Oscar Schmidt’s technicians, ensuring that fret ends are smooth, action is precise, and sound quality is beautiful. Perfect for learning to play ukulele the right way, and fantastic for continuing your musical journey, this uke continues to offer standout performance in every way. 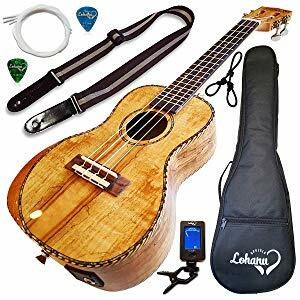 The Lohanu Spalted Maple concert ukulele is fantastic on its own, and it comes as part of a bundle that includes plenty of extras including a padded gig bag, a neck strap, and built-in strap buttons, along with video lessons to get beginners started off on the right foot. This ukulele features a spalted maple top, back, sides, and neck, a rosewood fingerboard, and slot head tuning gears. Extra Aquila strings are included. This uke is fitted with a 3-band EQ and an electric pickup, along with a built-in tuner. An unconditional lifetime warranty is included. I did hours of research and finally landed on this Lohanu. This uke screams quality, it sounds beautiful, and it seems like the best value for the money. This is a beautiful instrument with a fantastic sound. The laminate gives the instrument a beautiful look without any sacrifice in sound or tone. Tuning pegs are geared and hold pitch well and the electronics sound great in my amp. If you’re hoping to play with a band and you’d like an electric ukulele, this one is definitely the best in its price range – plus, you can play it acoustically so you get the best of both worlds. The electronics are not the best on the market however they are backed by warranty and previous customers mention that Lohanu goes out of its way to take care of any problems. Overall though, the instrument is a joy to play, with a full, rich sound and plenty of resonance. Most people who try it love it and mention that they’re amazed that they received an instrument as nice as this one for less than $200. The Bondi Concert Ukulele features African mahogany wood construction, a handmade deluxe saddle, and an engraved sound hole. It arrives with Aquila strings and comes with a leather strap in a rainbow etched design. 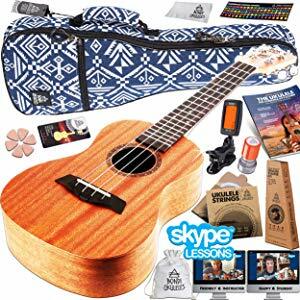 This ukulele is part of a huge bonus package that includes a very nice compression case, a tuner, a Skype lesson, an 11-part video series, and lifetime support as well as a lifetime warranty on all components. Bondi stands behind this ukulele with a 30-day money back guarantee. Every ukulele sold contributes to putting a Cambodian teacher through Bondi’s ukulele course, helping kids learn music as part of their education. Some confusion about how to get access to the video and Skype lessons; However, per Bondi, these are emailed via Amazon but will not arrive if you check the “Don’t receive follow-up emails” box when ordering. If missing this info, contact Bondi directly. You will not be disappointed with the purchase or the customer service. Bondi is top notch! Excellent bundle and we love the free lesson. My child had no clue about anything and they got her headed in the right direction. Make sure you have good internet with the latest Skype update before you get started. Bondi is a standup, standout company that serves the community along with its customers. The instrument itself represents a good value and the extras are worth quite a bit more than what you pay altogether. 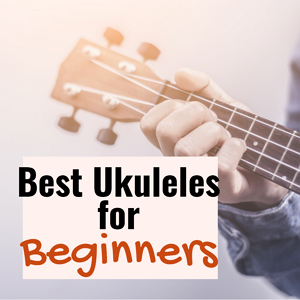 This setup might not be ideal for someone who doesn’t need accessories and introductory lessons, but for a beginner, it’s an outstanding deal that includes a ukulele that sounds great and provides more than a few years of enjoyment. Whether you’re brand new to ukes or if you’re looking for a nice upgrade, Bondi is more than just decent. While it’s possible to find a decent ukulele under $100, you’re going to enjoy some added benefits if you have a little more money to invest in a ukulele under $200. If you’re hoping to hold onto the same instrument for more than a few years, this is probably the most reliable category to search in. Here are a few things to keep in mind as you make your selection. Body Style: Did you notice that all the “under $200” ukuleles we reviewed were concert size? Many of these come in other sizes, but concert size fits most players pretty well – it’s small enough for most kids to learn on and comfortable enough for most adults as well. The sound is a little bit richer than what you’ll find in a soprano uke, yet it’s definitely got plenty of desirable “Island” quality. Materials: You’ll find that some of the best ukuleles in the under $200 category offer solid tonewood tops and/or bodies, while others are laminate. Don’t be afraid to give laminate ukuleles a try, particularly when they receive favorable reviews from others. They’re generally a big step up from plastic, and when paired quality components, laminates can be perfectly acceptable. If you’re absolutely set on solid tonewood, you’ll find some good choices here as well as in the ukuleles under $500 category. Accessories: Many of our favorite ukuleles come with added accessories. While these might not be as nice as high-end accessories purchased separately, they do cut the price of your overall investment significantly. Who’s playing: While experts are likely to appreciate ukuleles in higher cost categories, there are plenty of nice choices here for intermediate players and beginners alike. 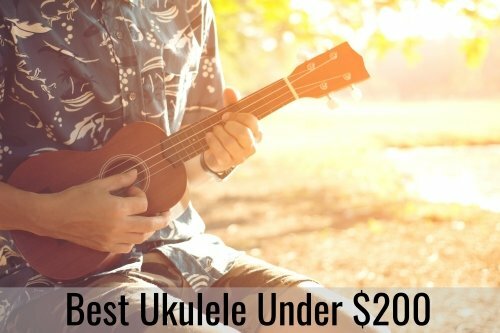 And, if you’re someone who loves to play but doesn’t want to risk a nicer instrument by taking it to the beach or on backpack trips into the mountains, a ukulele in the under $200 category is likely to serve you well by sounding great and keeping worries to a minimum.